Be the first to share your favorite memory, photo or story of Socorro "Soco". This memorial page is dedicated for family, friends and future generations to celebrate the life of their loved one. 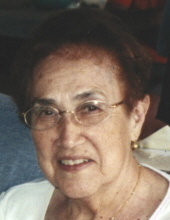 Socorro “Soco” Rivera, 98, of Fostoria, passed away at 8:05 am Monday April 1, 2019 at Good Shepherd Home, Fostoria. She was born June 25, 1920 in Fostoria to the late Ignacio and Carlota (Sanchez) Munoz. She married Elias Rivera and he died in 1986. Surviving is a son, Armando (Mariaeugenia) Rivera, Mexico; five grandchildren, Darren Rivera, Fostoria, Liz Rivera, Mexico, Windy (Norm) Elchert, Bascom, John (Antoinette) Rivera, Fostoria and James Rivera, Fostoria; and 12 great-grandchildren. She was also preceded in death by two sons, Arthur (Laurie) and Albert Rivera; granddaughter, Angela Powers-Rivera; brothers, George, Tony and Peter Munoz; and sisters, Antonia Macias and Maria Frias. Soco was a homemaker and a member of the Assembly Hall of Jehovah’s Witnesses, Fremont. She loved her church and her family, especially her grandchildren. She will be fondly remembered as a wonderful cook and a Cleveland Indians fan. Visitation is Thursday April 4, 2019 from 2-4 pm at HOENING FUNERAL HOME 242 W. Tiffin St., Fostoria. A memorial will follow at 4 pm. To send flowers or a remembrance gift to the family of Socorro "Soco" Rivera, please visit our Tribute Store. "Email Address" would like to share the life celebration of Socorro "Soco" Rivera. Click on the "link" to go to share a favorite memory or leave a condolence message for the family.